Getting to Flushing Meadows Corona Park is easy. Check out our Location and Directions page for detailed information. We strongly recommend taking public transportation as parking areas within the park are extremely limited. If you must drive, we suggest using the Campus Lot (B, C, D, E, and F) at Citi Field, where paid parking is available. The festival is free to attend. We also have a VIP section, which can be purchased in advance. Visit our ticket page for more information. You don’t need tickets for the general audience section, but advance purchase is required for the VIP section. Do children need tickets to VIP Areas? Yes, everyone needs a ticket to access the VIP area. Is there reserved seating? What is the seating policy? 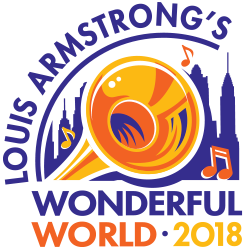 Louis Armstrong’s Wonderful World is open to the public. Premium viewing areas are available with a VIP ticket. Please visit our ticket page for more information. VIP wristbands (advance purchase required) can be picked up at the Guest Services tent on the day of the event with proper ID. General admission does not require a ticket. There will be designated handicap accessible drop-off area near the Queens Museum. If you think you might need assistance please send an e-mail to info@armstrongswonderfulworld.com, or visit the Guest Services tent on the day of the Festival. We strongly encourage you to contact us in advance, as access is limited. What if there’s rain in the forecast? The Festival is RAIN or SHINE. However, extreme weather such as thunderstorms, strong winds, or other conditions may cause delays, and in extreme cases, cancellation of the event. Please check our Home Page on the day of the event for updates on weather or related conditions. Will food and drinks be available? Absolutely! There will be tents around the festival site offering local queens favorites. There will also be an indoor lounge serving drinks and cocktails in Queens Theatre. Please be advised that photographs will be taken at the event for promotional purposes. By entering this event you consent to the festival photographing and using your image.